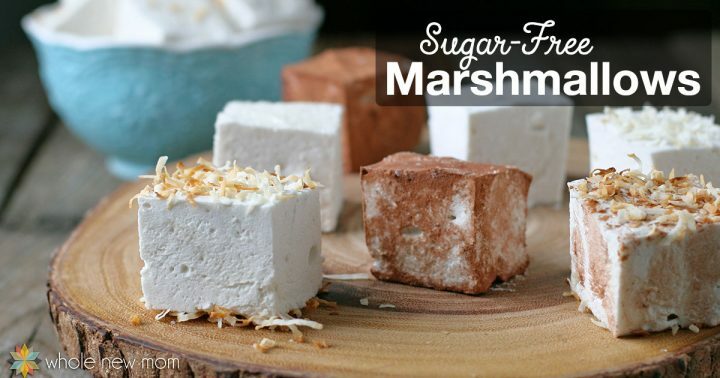 These Sugar-free Marshmallows are fluffy, light, low-carb, and fun to make. Plus you can easily vary the sweeteners for your dietary needs. 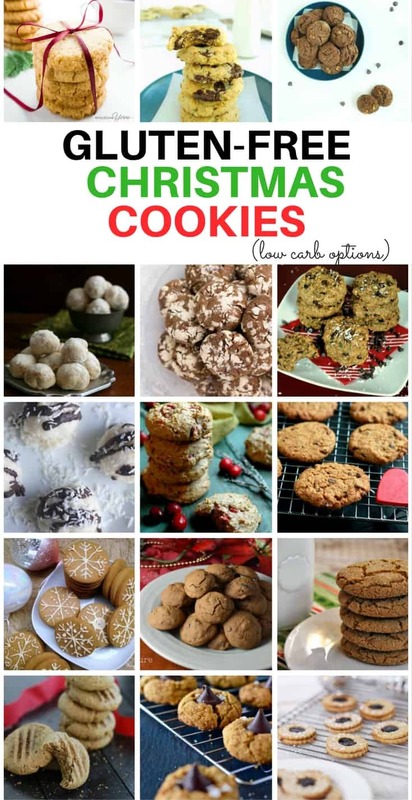 I'm always trying to make healthier versions of processed foods – like Homemade Chocolate Chips, Homemade White Chocolate Chips, Taco Seasoning, Hamburger Helper, and Chocolate Frosting. 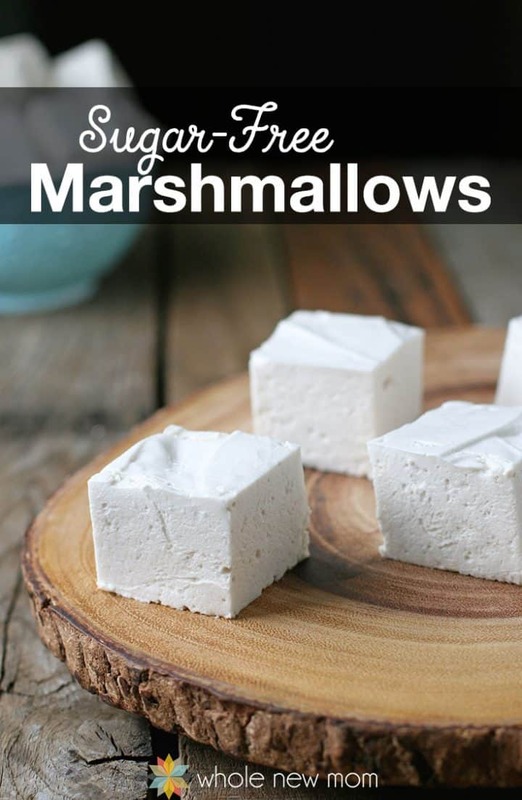 But one of our all time favorite recipes is on that I'm sharing with you today–Homemade Sugar-free Marshmallows that can also be made as low-carb marshmallows. Once on Facebook, I mentioned to my fans that I ended up staying up 'til 12:30 making homemade marshmallows and gluten-free graham crackers for my kids. There was a ton of really fun and thoughtful responses, including a number of readers asking for the recipes. Well, here is the marshmallow recipe, that just happens to be sugar-free. The graham crackers weren't quite really what we wanted, so I'll be going back to the drawing board on those. By the way, in case you aren't plugged in with us on Facebook, I'd love you to join us. I share great finds, articles, recipes, and Free E-Books that I find throughout the day. And sometimes we deal with real-life health questions that readers are dealing with. But – onto the important matter at hand – the homemade marshmallows recipe. Back in my eating-way-too-much-sugar days, I first made homemade marshmallows with my son. What fun! To see water, sweetener and gelatin turn into white fluffiness in a bowl and then turning into marshmallows that tasted much better than anything I'd ever bought in a bag. The reason we made them in those days was to avoid blue food coloring. Yes, blue food coloring is in almost every package of marshmallows. Well, of course you could use my natural blue food coloring and add a bit to your own marshmallows if you want. Why else might you make your own marshmallows? – Avoid Sugar – Sugar is just a huge problem, according to TONS of info on the web these days. And if you have candida, like I do, then sugar is a complete no-no. Many of you are eating Sucanat, coconut sugar, honey, etc. All, in my opinion are much better than white sugar. I plan to share more info on this soon. – And—if you are off sugar and have ever bought sugar-free marshmallows, then you'll save a TON of money with these. I just saw a measly 2.7 oz bag of sugar-free marshmallows for $1.99. Eek!! We made these in August with some Grain-Free Graham Crackers and my Homemade Chocolate / Carob Chips and made our own sugar-free, grain-free S'mores. They were great! We shared them with a special visitor from Australia. 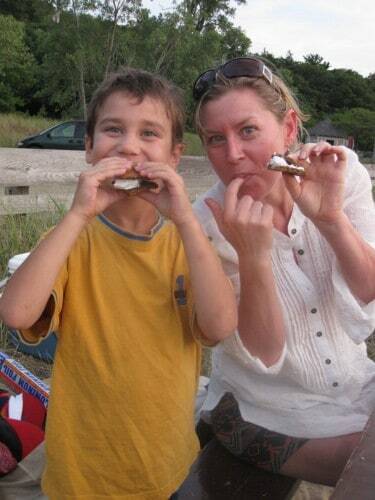 She didn't know what S'mores were, prior to coming to the US, but she does now :). I'll be sharing the grain-free graham cracker recipe soon….so make sure you subscribe to my email updates so you don't miss a post. This past week, since the grain-free experiment is done for now in our household (too much work for mom and really no apparent results), we tried gluten-free graham crackers, but they weren't a real winner. So it's back to the drawing board on those. And if you do decide to use xylitol and roast these in a fire, they don't really roast – but they do soften up. Just enough for S'mores :-). And if you use Sucanat, the marshmallows will of course be a brownish color. Stevia is super sweet so you only need a tad. I bought these (the links are affiliate links) scoops and use the 2nd smallest as “1 scoop,” or 1/32 of a tsp. Yes, it's THAT sweet! And if you're wondering about whether it's OK to eat stevia or not this post should help. This post on Stevia – What it is and how to use it should help too. 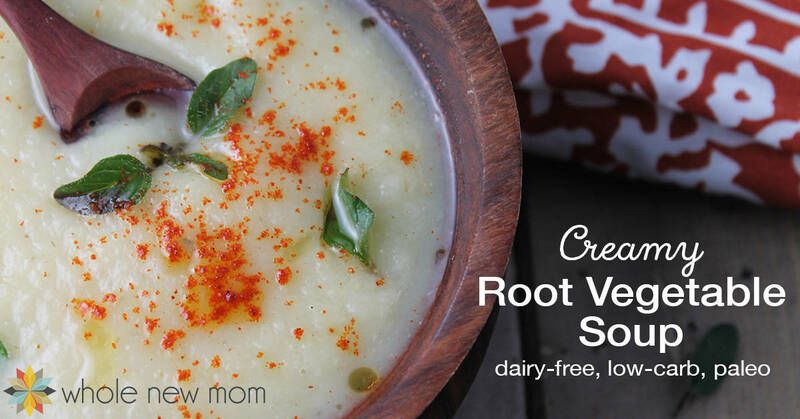 This recipe should work fine in silicone molds. Just spray the molds with a (preferably healthy) cooking spray or coat the molds with a small amount of vegetable oil. 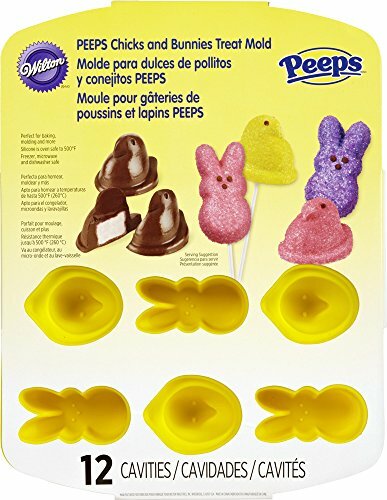 These molds would be SO much fun to use for Easter! You can also get adventurous and spoon your marshmallowey mixture into a plastic bag, snip off the ends and make fun shapes for holidays. Vegan Option: For a vegan marshmallow option, use agar powder in a 1:1 substitution for the gelatin. I personally haven't done this but it is supposed to work out just fine. Enjoy! If you are attempting to make a vegan option, be aware that you might have varying results. You do need to let the agar sit on the water for about 1 hour before using it. Also, the results with agar can be variable so please be aware. I am going to try to do some experimenting to see if I can figure out what makes them work vs. not work. Xylitol: Any other healthy sweetener can be used instead of xylitol, but if using erythritol use 1/3 more. If using a liquid sweetener, you may need to use a different amount, so read How to Substitute Sweeteners first. Approx. 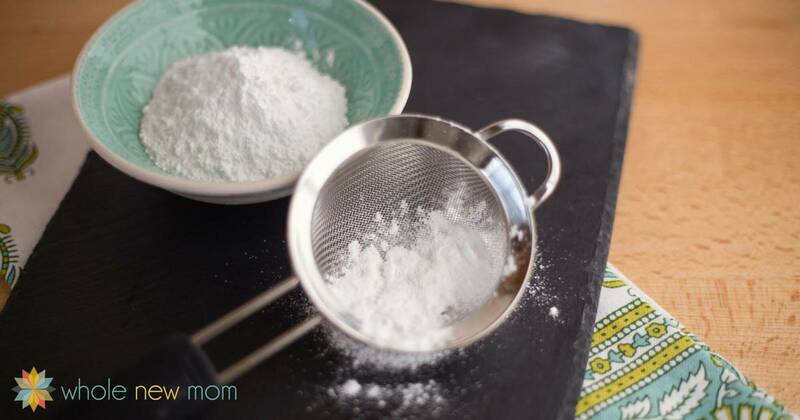 12 scoops (3/8 of a tsp) of stevia (see How to Use Stevia) will work. Use honey, maple syrup (read this post for help choosing maple syrup), coconut sugar, or sucanat for AIP. Glycerine: You can also substitute any healthy sweetener for glycerine. Again, though, if using a granulated sweetener a different amount may need to be used. If you're on the THM diet, use xylitol or erythritol – again, use 1/3 more if using erythritol. 1. 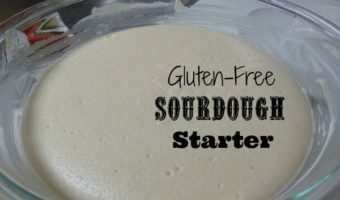 I've checked out a number of other recipes on the internet and a lot of them use just a 1:1 ratio of water to sweetener so it looks like that will work too. I just didn't try it. 2. Also, one reader commented that she tried this recipe using only erythritol and it didn't work out well. I haven't tried this, but if you are going to, please try a small batch first or at least be prepared that it might not work out. Roasting: If you would like to roast these marshmallows, let them dry for a few days before roasting. I haven't tried this yet but I read this should work so I'll have to give it a run with a few different sweeteners to see how it goes. If you do, please share in the comment area. Gelatin: For gelatin, I highly recommend Great Lakes – it's made from pastured cows w/ no antibiotics in their feed. Filtered Water: Please make sure to keep your water filtered (see How to Make Your Water Safe). 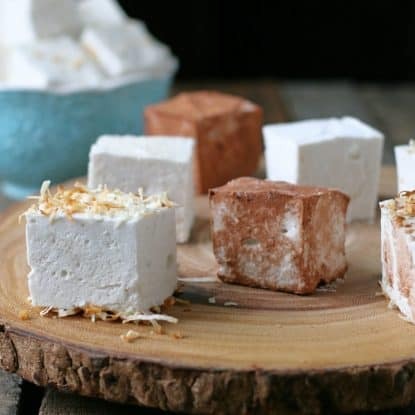 These Homemade Marshmallows are super fun to make and have no artificial flavors or colors. Make them sugar free for a low carb treat. In a medium to large-sized bowl, sprinkle the gelatin over the cold water. Allow to sit for at least 5 minutes. In a heavy bottom sauce pan, stir sweeteners and remaining (hot) water. Heat sweeteners and water over high heat until the mixture reaches 240 - 245 degrees Fahrenheit, or the soft ball stage. Gradually (and carefully :-)! ), while mixing constantly, add the hot mixture to the water and gelatin mixture. Slowly add the vanilla to the mixture while beating. Beat on high until the mixture form stiff peaks (almost like beaten egg whites). Pour into a lightly greased 8x8 pan. You can use whatever size pan you like to make either thick or thin marshmallows. The 8x8 pan will make pretty nice-sized thick marshmallows. Allow marshmallow to set. Then cut into desired sized. 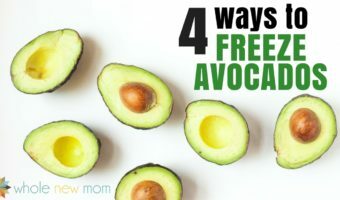 This can take 6-24 hours (I've never had it take that long), but you can put them in the freezer to speed it up -- just don't forget they're in there :). If desired, coat with cocoa, raw or toasted coconut, ground up nuts - have fun with your toppings! Store in an airtight container and try to keep your kiddos out of them! Are you a S'more or marshmallow lover too? Hi! Is glycerin necessary? Can I substitute it with something else? You are so welcome! Hope they turn out well for you! Upon reading, I find it hard to understand how to substitute sweetener. I do not like stevia and I was hoping to use either coconut sugar or honey, maple syrup may work for me as well but I am confused by how to do so.